Last few weeks brought intensive exchange of statements between FIFA and Russian organisers of the 2018 World Cup. FIFA suggested cutting two stadiums from the host list, trying to minimize risk of delays after experiences from Brazil. That option wasn’t acceptable for Russia, where the final list of 12 venues still proved not enough, seeing the football-friendly Krasnodar out. However, a different point was agreed upon by both parties. Two stadiums may be downsized from the planned net capacity of 45,000 to 35,000. This would be less than any World Cup stadium so far in the twenty-first century and also less than the required minimum of 40,000 net. However, FIFA already allowed Qatar to remove up to 3-4 stadiums from the host list, so the new decision isn’t surprising. 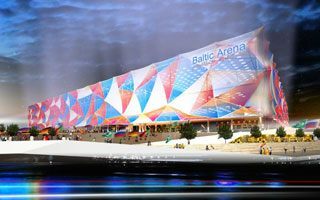 For the Baltic Arena in Kaliningrad (above) changes are of secondary importance. The stadium itself may remain largely unchanged, only the second tier of seating may be changed. It was already considered to be temporary so alterations may be small for a project of this scale. In Yekaterinburg it’s a different story. The stadium is already under fire for prolonged debate over final shape. Key point of the debate are the western and eastern facades, which are a listed monument. Various ideas as to what should be done to them were already announced. In 2010 they were thought to remain unchanged, but partly covered with new roof pylons. In 2012 a vision of very little changes to the architecture was soon replaced by a more drastic one, which would see the historical walls hidden behind a new façade. Then in 2013 came the newest idea to cut the old walls with laser and rebuild them in a new location, creating entrance gates to a brand new stadium. Now all of these visions are considered out of date as new concept and documentation need to be worked on. With 35,000 the stadium cane easily be fitted into the existing walls, which was a very big challenge for the initial capacity. This idea is problematic as it will cause further delays. Meanwhile already in late 2013 the company Sports Engineering warned that half a year more and the stadium won’t be ready in time. It will also miss the governmental deadline of groundbreaking by the end of 2014, if a new plan needs to be drawn. Sports minister Vitaly Mutko declared he prefers the stadium to be left unchanged from the outside. “We won’t raise our hand on that stadium and demolish it. We’d like to re-do it like we’re doing Luzhniki, leaving exterior untouched. Only the inside will be changed, while historical facades will remain”, says Mutko. To date there are no declarations of prices falling along capacity. This new might be welcomed by many Russians as the Russian stadiums will be by far the most expensive ever. Currently each of the group phase arenas has price capped at RUB 15 billion ($400m / €305m).